I guess I keep thinking that if I watch this movie enough, I’ll finally understand it. I mean, I can follow the plot. It’s the tone that’s like monkeys throwing poop. It zooms between farce, romance, and drama. It’s from 2005 but feels a decade older. It uses and overuses montages and voice-overs to frost over the crumbly bits. And then it gets DARK. A woman, Helen (Kimberly Elise) is thrown out of her home when her philandering husband finally gets tired of her after 18 years. The pre-nup says she gets nothing. Helen is broken but her grandmother is there to put her back together – the grandmother being played by Tyler Perry, of course, in his first appearance as the famous Madea. Even if you’ve never seen a Madea movie, you know that she’s loud and proud. Of course she is. Perry is hamming it up for all he’s worth. He knew this was his chance to spawn himself a franchise, and he did. A whole empire, in fact. 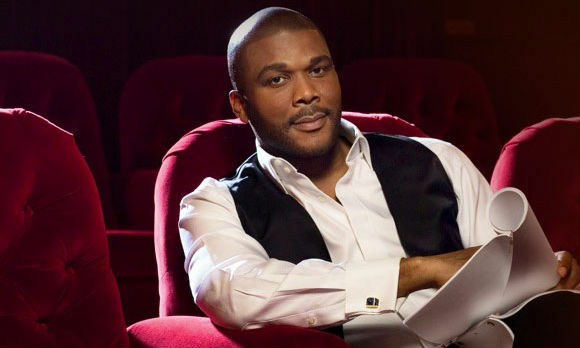 Tyler Perry is a talented man. I don’t love Madea the way some do, but it is refreshing to see every day families and strong women taking centre stage. He writes what he knows. And Perry knows his audience too, an audience that Hollywood largely ignores. His movies routinely make $50M against a budget half that – it’s a rate of return you can’t ignore. Madea has her roots in a series of plays that Tyler Perry wrote and staged across the country. They were filmed and available on video for years before he got to make a movie. But after a strong of successes, on the big screen and the small, now he’s got carte blanche. Good for him. He circumvented obstacles by doing it all himself and never compromised a principle. This entry was posted in Half-assed, Movie Reviews and tagged Kimberly Elise, Tyler Perry on September 3, 2016 by Jay. Lacey (Tika Sumpter) calls to tell her mother that unfortunately she won’t be able to make it home for Christmas this year. What she really means is: I’m hiding a white boyfriend from you. But she can’t bring herself to say it due to her mother’s weak heart, so she makes her excuses and begs off. What Lacey’s mother Eileen (Anna Maria Horsford) hears is: Mama, I love you, I miss you terribly, please make my Christmas dreams come true by showing up unannounced. Which of course Eileen does, with none other than aunt Madea in tow. Eileen and Madea (Tyler Perry) think white boyfriend -Connor is just the “farm hand” and Eileen finds all kinds of clever ways to be rude and dismissive. And when Connor’s parents (Kathy Najimy, Larry the Cable Guy) show up (invited), the house is crowded and Eileen’s attitude goes into overdrive. I usually really dislike Madea movies, I find them juvenile and too ludicrous to laugh at. I’m not sure if this one is better than average or if I’ve just watched too many schmaltzy Hallmark holiday movies, but this particular one I managed to make peace with. A Madea Christmas is a ‘Who’s who?’ ( note the question mark, it’s a real difference maker) of washed up, c-list celebrities of yesteryear. Chad Michael Murray plays a real redneck racist, and the costume designer slaps an American flag on every available surface of his clothing to prove it (and this, mind you, is pre-Trump, and downright prescient). Tyler Perry is a genius, and while I don’t usually like his Madea brand of comedy, plenty of people do, which is why he keeps churning them out (to the tune of 500 MILLION DOLLARS). Perry claims that his next Madea film, due out in 2019, will also be his (and her) last, after 15 years of films, a real end of an era. I suppose now’s the perfect time to binge some of the canon, and A Madea Christmas isn’t a bad place to start, especially if you’ve got an aversion to anything overtly romantic or princessy, or – puke alert – both. Maybe Perry’s just on point when the material’s about race, but Madea seemed funnier to me than she ever has before, and I gave up more than a few chuckles before the film was finished. Comedy is hard, and no joke appeals to everyone. I’m realizing that we tend to be much harder on comedies that don’t quite work than on dramas that don’t quite work, but the truth is, I’m grateful to funny people who make the effort. Of course they’re not all out-of-the-parkers, few can be, but a swing and a miss means they’re still in the majors and I’m in the stands, ready to laugh. This entry was posted in Movie Reviews and tagged Anna Maria Horsford, Chad Michael Murray, holiday movies, Kathy Najimy, Larry the Cable Guy, Tika Sumpter, Tyler Perry on December 1, 2014 by Jay.